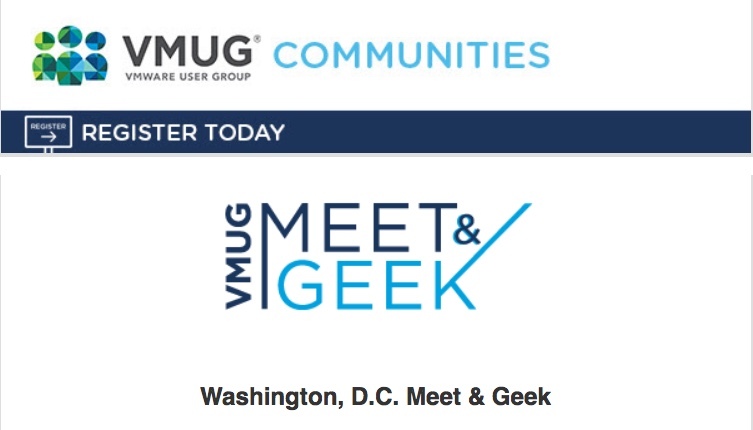 DCVMUG & MyVMUG members, please join us for a great time at the Washington, D.C. #MeetAndGeek, hosted by VMware on Wednesday, August 22nd from 4-6pm at Mortons Steakhouse in Reston, VA.
VMUG #MeetAndGeek events are casual gatherings (no agenda!) for local community members to connect & talk tech over food and beverages. Please take a moment to thank Craig Connolly & the friendly staff from the VMware Reston office when you arrive for their efforts. You can RSVP using this link (https://tinyurl.com/y89psnmx) and we hope to see you there!